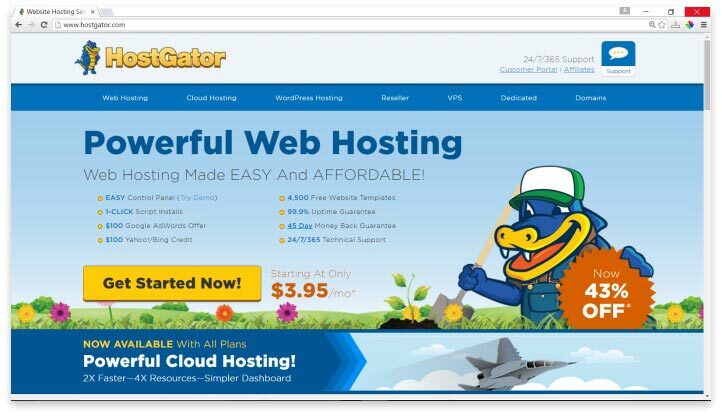 HostGator began hosting websites in 2002 from a dorm room, similar to many of the great websites of our day and age. It only took a few months for HostGator to pass 100 active customers, and five years later, they had two international offices. Since 2009, they’ve routinely won awards for their fast growth, best web transfer services, and best hosting services for small businesses. In 2012, they were named the best host of the year by the WordPress Hosting Review. While information about development and awards ends around 2012, their blog continues to be regularly updated with useful web management posts, making it clear that HostGator is still offering their great services to nearly one million websites worldwide. The first thing that any potential user will notice is that HostGator’s interface is largely outdated. It’s not an easy website to navigate, and the clunky UI doesn’t appeal to modern users, who expect their hosting service to be as up-to-date as possible. That being said, there’s no denying that HostGator’s services are solid and dependable. Their shared hosting plan is affordable, and they have Weebly site-building software that makes it easy for most users to build a basic website. While there is a WordPress import feature, it’s not a simple one-step process. Additionally, their email services lack security features, like spam filters, which are nearly impossible to do without when you’re relying on the service for business purposes. The technical support is promoted as 24/7, but many user reviews indicate, almost unanimously, that the service requires long wait times, and often inadequate solutions to problems. HostGator does have an extended 45-day money-back guarantee; if you find the interface too difficult to work with, or the customer service not helpful enough, you’ll have plenty of time to get a refund and try another service. Additionally, they offer multiple loyalty schemes that allow you to get discounts and credits for referrals. When their rates frequently run less than $5 per month, discounts can mean that your basic shared hosting could be only a couple bucks. HostGator is affordable for literally any budget, and you can get a basic, professional-looking site up relatively quickly. Overall, if you need a basic landing page for your small business, and don’t want to pay a lot for the most basic of hosting services, HostGator is probably one of the best options out there. It’s affordable for literally any budget, and can get a basic, professional-looking site up relatively quickly after you hunt through the interface a bit. For those who want modern sites filled with interactive and stylish elements, HostGator may still be a good choice. Build your website in WordPress, and then use HostGator as a more affordable alternative to WordPress’s own hosting service. The complicated integration may be worth it for the savings. Those who prefer their hosting service offer all the bells and whistles, and who want to pay a single website to do it all, are better off choosing another host. HostGator simply doesn’t offer the contemporary features and great customer service that you need to rely on them for a modern website hosting service. Their website’s lack of newsworthy buzz since 2012 is a tip off that their development as a company may be stuck in the past, which won’t work for a business charging ahead into the future. I got a dedicated server for my business at HostGator years ago because they promised good support. It has gone downhill ever since. Looking for a new hosting company. You can’t even start a ticket for support now, chat does not allow attachments and phone support always has long holds before you get someone to talk to.